you got some good pics hun! yeah, I'm happy. The seats were really great and I love the fact that we were allowed to take pics all the time with our flashes on. u're very welcome :) Glad you enjoyed them. Thank you so very much for sharing this with us. It's really nice to see all of these. Combined with the collected videoclips and recounts, it's really like being there... or close to, for those of us who didn't make it. heh, it is totally my pleasure!! I know how I feel when there are events and I cant attend. 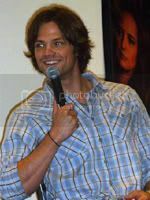 So the least I can do is to share the pretties with everyone :) Gotta spread the SPN love. wow martina, great pics...i didn't get any good ones, so i've been relying on everyone else that went to capture the memories!!! thanks so much for sharing! I have some pretty to look at now. Thanks, M! these are awesome thenks for posting! Thanx so much for sharing with us your amazing photos! They’re absolutely lovely! I’ve saved all the pics from the first two albums, and am gonna grab the others from the two remaining albums! There’s so many! I love it! Darling. There are AWESOME PICS HERE.